High Earners Can Still Get Into a Roth IRA - Financial Symmetry, Inc.
Did you know that you can access a Roth IRA at any income level? For most individuals they assume if your modified AGI is greater than $193,000 if you are married filed jointly, or $131,000 for single filers they cannot make a Roth IRA contribution and their only option is a non-deductible IRA. This is partially true, but many don’t realize Roth IRA conversions are not limited by income level. As a reminder, the Roth IRA 2014 and 2015 contribution limits are $5,500 per year and an additional $1,000 if you are over 50. The benefits of a Roth IRA are earnings grow tax-free with no required distributions when you reach age 70 1/2 like other IRA accounts. In addition, a Roth IRA can make a wonderful inheritance, giving your beneficiaries years of tax-free income using a strategy known as the “stretch IRA”. The one important caveat is that if you have other IRA assets without a basis (e.g. pre-tax contributions or gains) a portion of the gain will be taxable. For tax purposes, you can’t pick which IRA to convert. Instead you have to assume the money comes proportionally from all your IRAs combined. One option to offset this is many 401k plans today will accept existing IRA assets so you could transfer existing pre-tax contributions and gains into your existing 401k. That being said if you have less than optimal investment options in your existing 401k that could make rolling your IRA into your 401k unattractive. I do recommend working with a fee-only financial planner to assist with the process to avoid any unnecessary tax surprises and determine whether it is a wise move. Some might ask why go through the hassle. 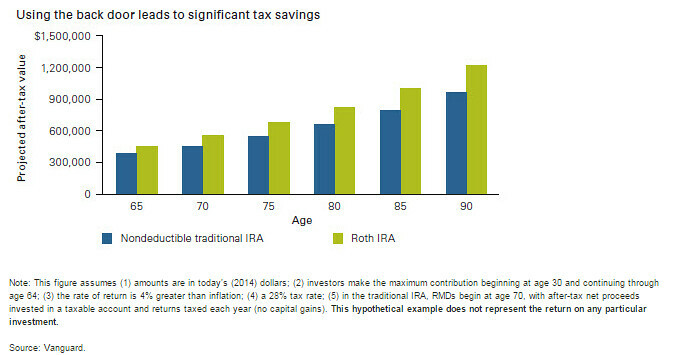 Well, according to Vanguard’s chart below the tax savings from completing this strategy can be significant over the long-term and this does not even include the benefit to your beneficiaries. In summary, even individuals with high income can access the Roth IRA. As noted in the chart above it can result in significant lifetime tax savings. Please contact Financial Symmetry if you have any questions regarding your financial situation and whether a Backdoor Roth IRA is an option. A revised version of this article was published by nerdwallet on January 30, 2015.